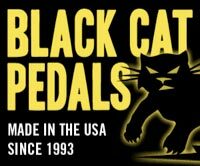 Here's a video of the Black Cat OD-Fuzz that was made by Warren from New Zealand (though his accent suggests he is not a native Kiwi). Warren made a very clever and interesting modification to his OD-Fuzz that he'll describe when you watch the video. The video itself was very nicely done and we all really enjoyed it - thanks Warren! Very well done and demoed. Loved the ghost comments, helpful and funny. One drawback with his mod is you can't run both at once, which is my preferred setting with everything at 11, as this hides my atrocious playing. Nice video! I like the guy's humor, but would also agree with last comment... why would you make this mod? Great playing on his part as well... awesome sounds!